Regardless of whether you’re a book lover or not, chances are you have a few papery pals hanging around your home that you need to store or display. So whether it’s a handful of coffee table books and magazines or complete collections from the classic cannon, we’ve gathered 30 ideas from home libraries around the globe to bring you some inspiration. Happy reading! 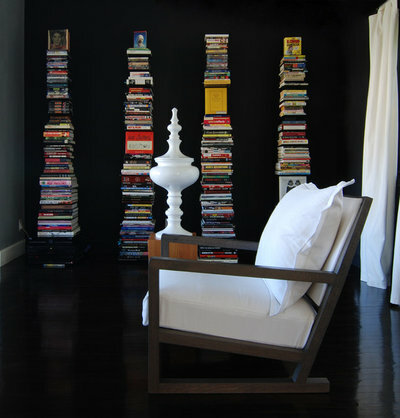 These black walls and stacked shelving systems redefine your traditional ‘library’. 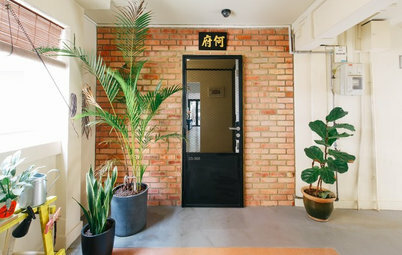 As Junichiro Tanizaki writes in his essay In Praise of Shadows on Japanese aesthetics, “In the mansion called literature, I would have the eves deep and the walls dark”. 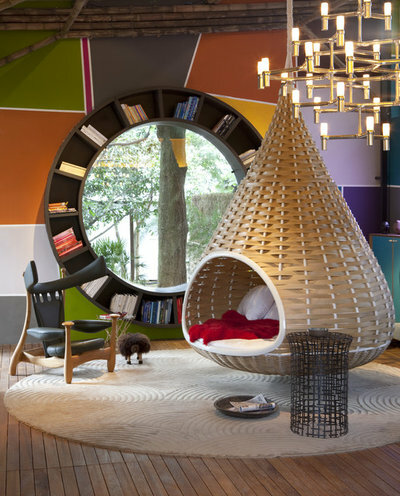 From the hanging chair that forms a dreamy reading nook to the circular bookshelf, you have to admire the creativity behind such an original home library. Because not every bookshelf needs to consist of straight lines at right angles. This snaking shelving system has curves in all the right places, which mimic the chaise and the rug flung on an angle, just to spice things up. A supersized take on your traditional magazine rack, this sculptural bookshelf is formed of two stackable pieces, meaning you can create almost any shape and size you desire. 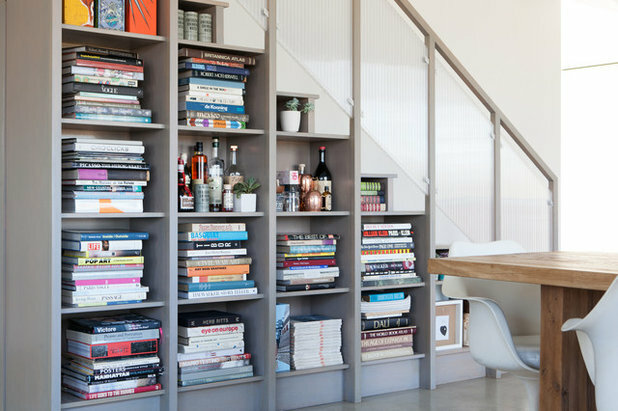 This futuristic bookshelf doubles as a staircase and throws a curve ball at the straight lines that have traditionally dominated our bookshelves. 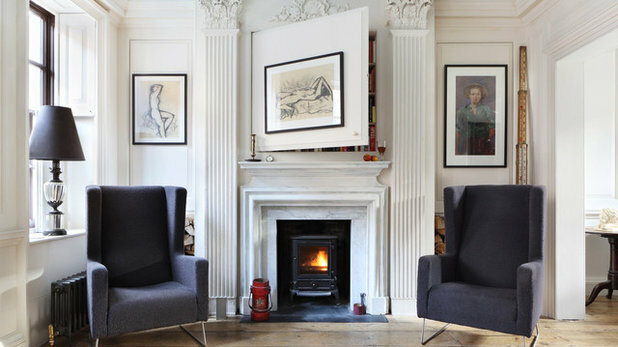 The eclectic mix of framed photos, sculptures, found objects, empty space and books – both horizontally stacked and vertically arranged – proves your shelves don’t have to be exclusively reserved for the classics. 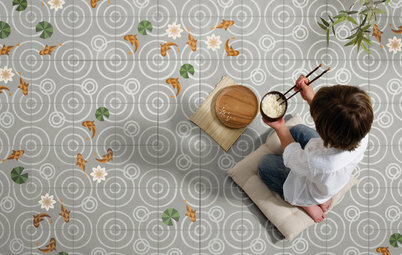 Can’t choose between straight lines or curves? 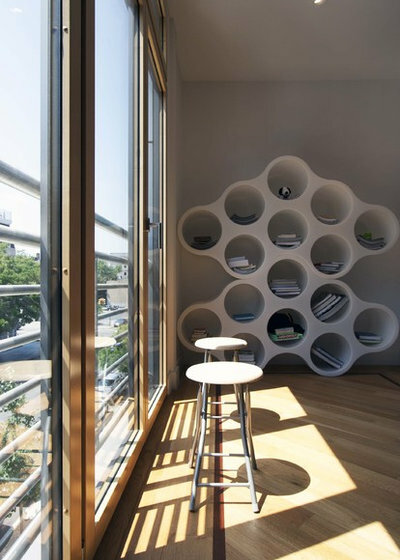 The rounded corners of these stackable bookshelves prove you might be able to have both. 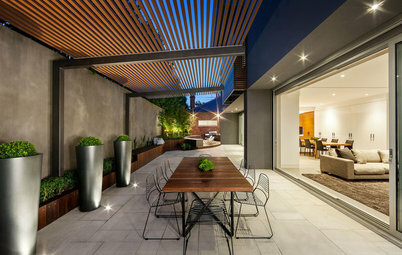 Tip: To make a design statement, display titles from a series or in a unifying colour. 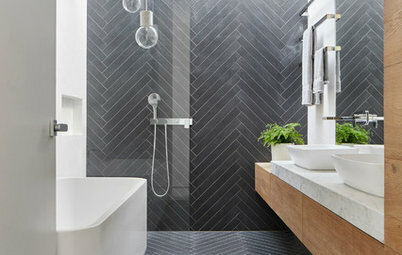 There’s no need to steer away from right angles entirely to create a point of difference. Instead, you could simply turn them on a 45-degree angle. 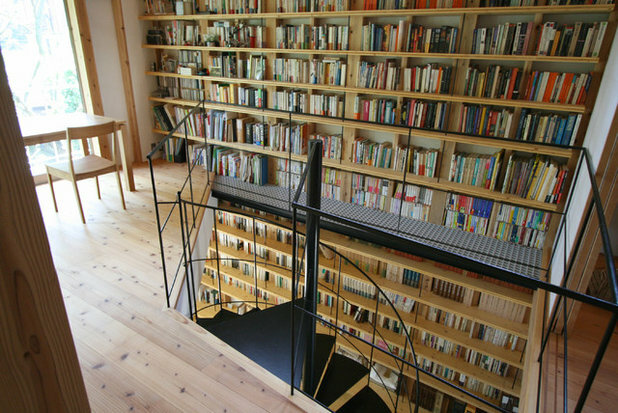 If you want to subtly introduce some acute or obtuse angles, take inspiration from this home library. 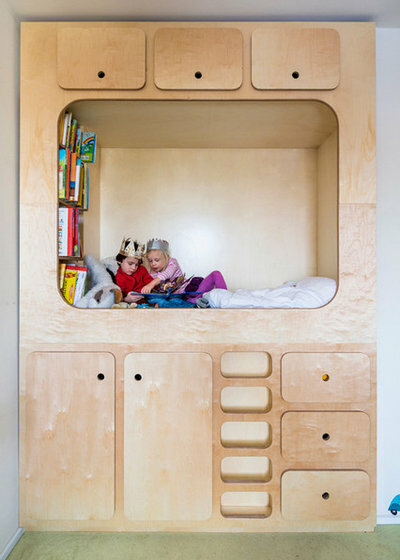 Love it or loathe it, you can’t help but respect the confidence of this recessed reading nook with its dark, brooding walls and flourishes of fluorescent furniture. 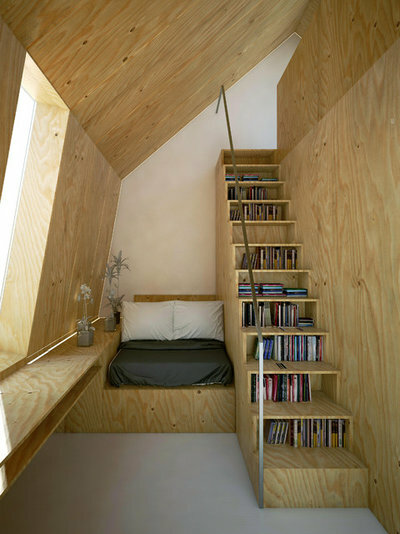 This book nook takes the concept one step further, using the home library’s shelves to frame each side of this upholstered window seat. 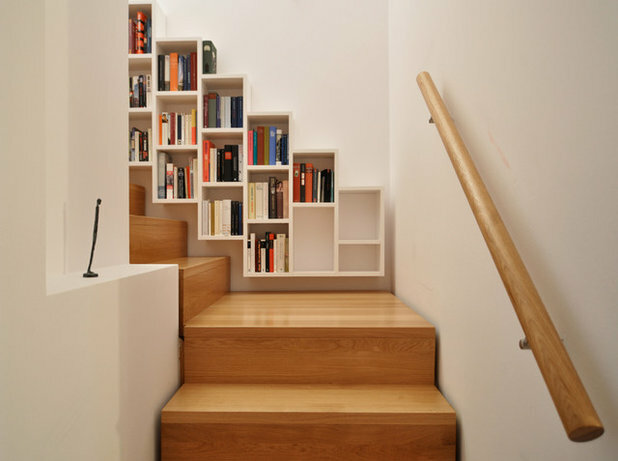 It seems there is no end to the creative ways you can use a staircase to store your books. 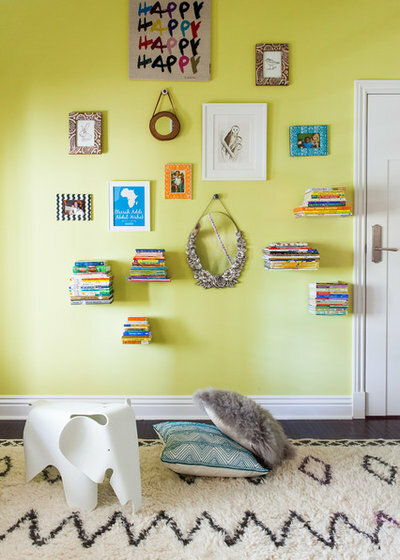 Tip: Larger books in particular can make an impact when stacked horizontally. 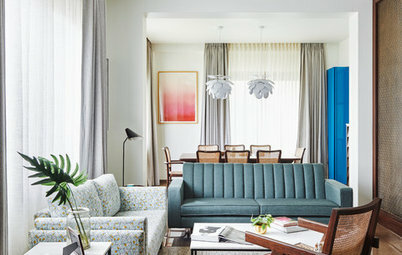 The differing heights of the boxes in this floating bookcase let its owners store and display small paperbacks as well as large coffee table books. 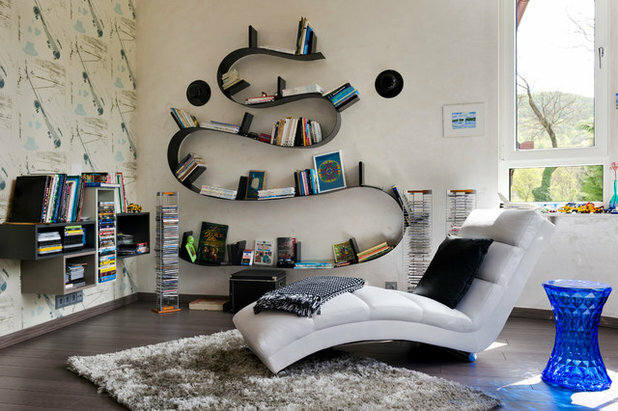 Think you don’t have enough space for a bookcase in your room? This tiny French bedroom proves there’s always room for a few shelves to store your favourite volumes. 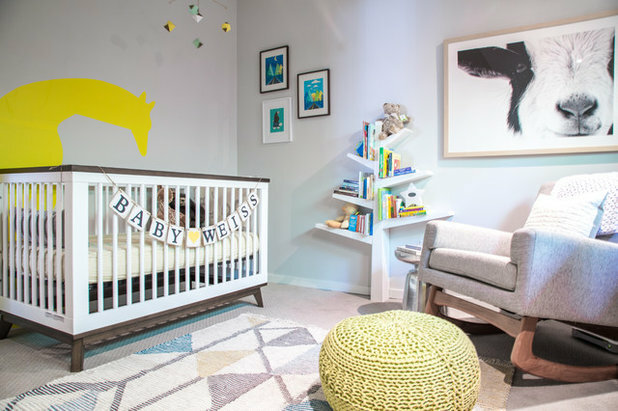 They say a love of reading develops at a young age, and what better way to foster a passion for literature than to create a fun, cosy book nook? 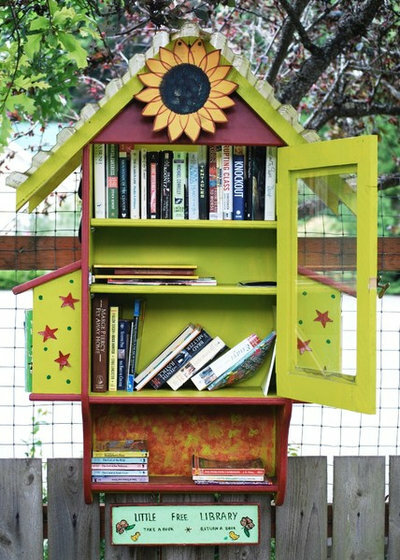 The ladder throws a spirit of adventure into this little library – a design feature that’s sure to inspire a love of books from an early age. 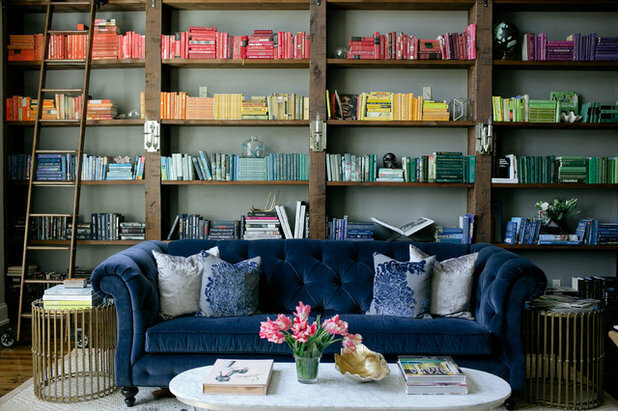 Every colour of the spectrum shines in these cheerily arranged shelves. Love your books to bits? 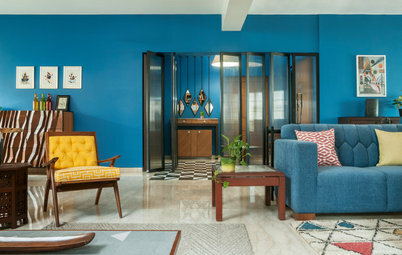 Take inspiration from this home and literally put them on a pedestal to elevate your library and delineate this sacred space. Money may not grow on trees, but in this nursery books do. By staggering the alignment of these small floating shelves and varying their widths, this book collection complements the framed art and acts as a creative installation. If you’ve done enough thinking outside the box, maybe it’s time to embrace that box instead, as with these classic rectangular floating shelves. 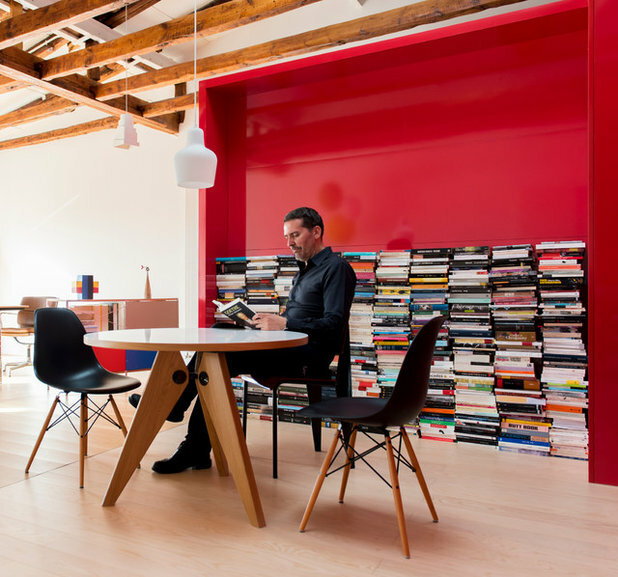 Many minimalists have a love-hate relationship with books because they can easily clutter the aesthetics of a room. 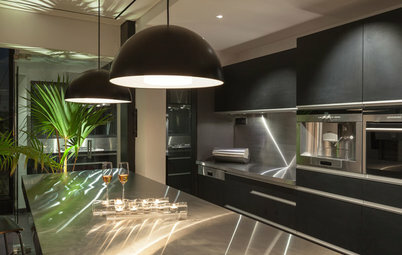 But this space proves it’s possible to have your minimal slice of literary pie and eat it too. Tip: To further enhance a sense of order in your shelves, arrange books of similar heights side by side. 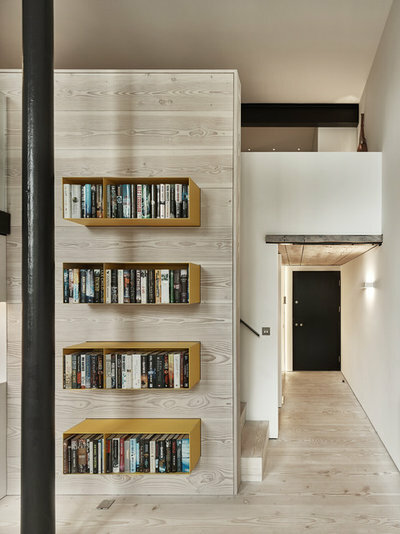 If you’re one of the many people who finds the look of shelves full of books too crowded, take inspiration from this library hidden within the joinery. 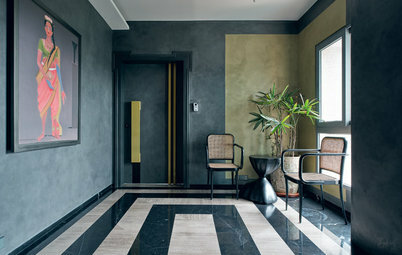 The entrance to the library in this Italian home makes a bold, grand gesture as it leads to a private readers’ retreat. 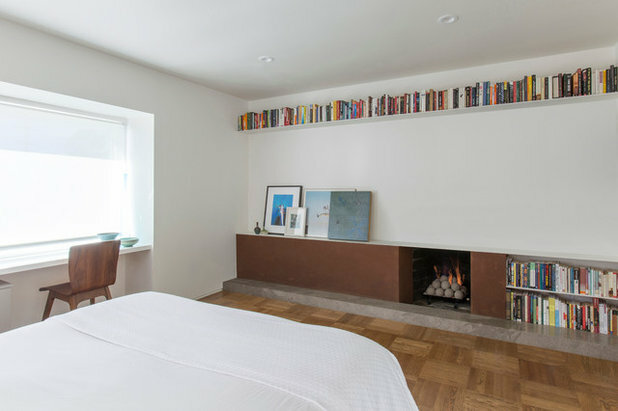 Those white panels hide bookshelves and a TV and can be opened or closed to reveal or conceal the joinery and its literary contents. 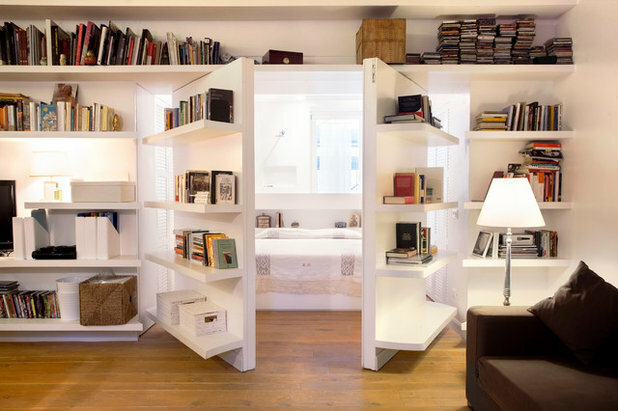 If you’ve ever longed to escape with a book through a secret door and curl up away from all noise and chaos until you’ve read the last page, you might envy these homeowners. 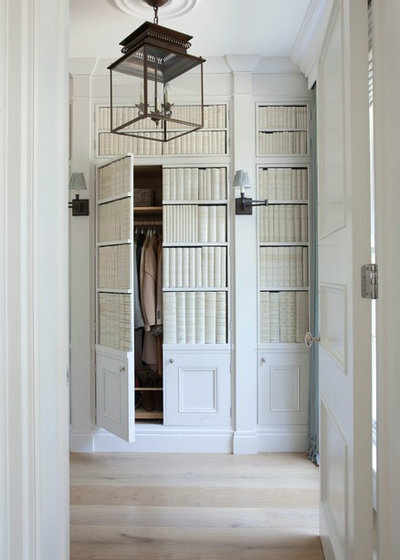 Here’s one for the non-readers – this coat closet is cleverly concealed by book-look wallpaper. 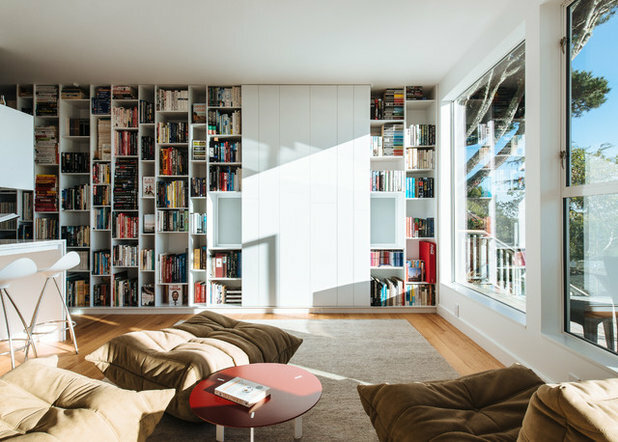 Because even if you’re not inclined to pick up a book, it doesn’t mean you can’t admire the look of a well coordinated home library, albeit in a slightly different way. 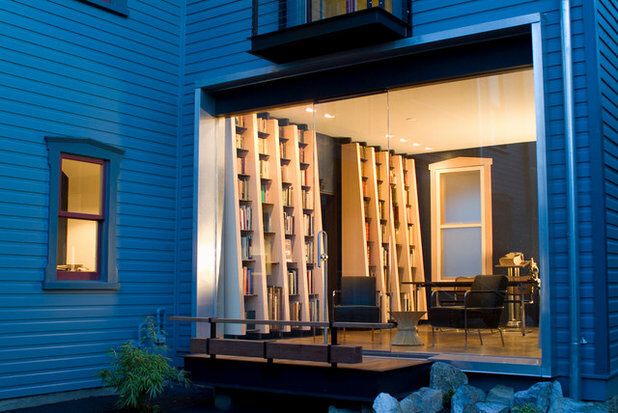 No room for a library inside your home? Consider joining the masses of households who have set up free community libraries outside instead. How do you store your books and what does your dream library look like? Tell us in the Comments below.